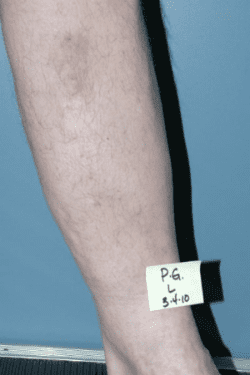 Most large varicose veins are caused by faulty one-way valves within the veins. 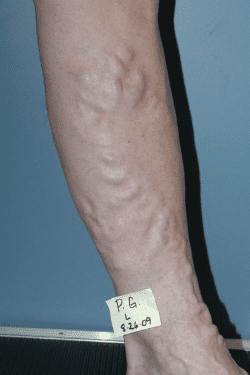 This results in back-pressure being exerted on the lower veins which causes those veins to overfill with blood, leading to the bulging, pain, and fatigue associated with varicose vein disease. Endoluminal Laser Ablation (ELAS, LASE, ELT) uses laser energy to “weld” an incompetent, or refluxing, vein closed so that the offending backflow of blood pushing back down the leg (the wrong way) is stopped. The ELAS is done in our office under local anesthesia and requires 30-45 minutes from start to finish. There is minimal discomfort and the patient is up and around the same day. The LASER procedure is so well tolerated by the patient and so effective in treating the incompetent veins that it has replaced “stripping” as the standard of care for varicose veins. Dr. McMullen has extensive experience performing the ELAS, and he is on the teaching faculty for Dornier MedTech, the LASER manufacturer. Dr. McMullen has lectured hundreds of physicians on the procedure and provides proctoring and on-site teaching for physicians wishing to learn and perfect their technique.